Figure 5.12. 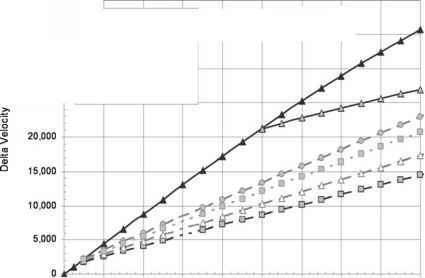 Velocity increment to rotate orbital plane for different orbital altitudes. Higher altitude requires less energy. 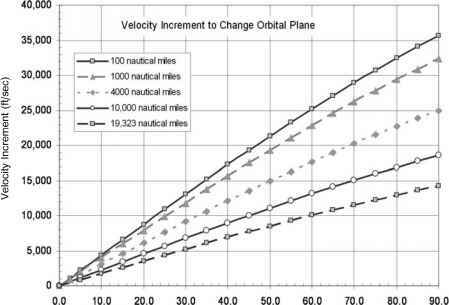 incremental velocity of 12,900 ft/s an orbital plane change of about 29 degrees is possible. That is, less plane change than required to move from the latitude of NASA Kennedy to the latitude of the International Space Station. Shown in Figure 5.13 is an impulse turn made from the GSO orbital altitude of 19,323 nautical miles (35,786 km), which requires about 11.5 hours to execute. This is one of the lower-energy solutions for the plane change. Increasing the altitude for the impulse turn to 36,200 nautical miles (67,042 km) decreases the incremental velocity to about 1,000 ft/s (304.8 m/s) but increases the mission time to 24 hours. As shown, the breakeven orbital plane change is 50 degrees. So if the orbital plane change is less than 50 degrees, it is best made from the spacecraft's orbital altitude, without any orbital altitude change. However, there remains the interesting possibility of using aerodynamics to change orbital plane.